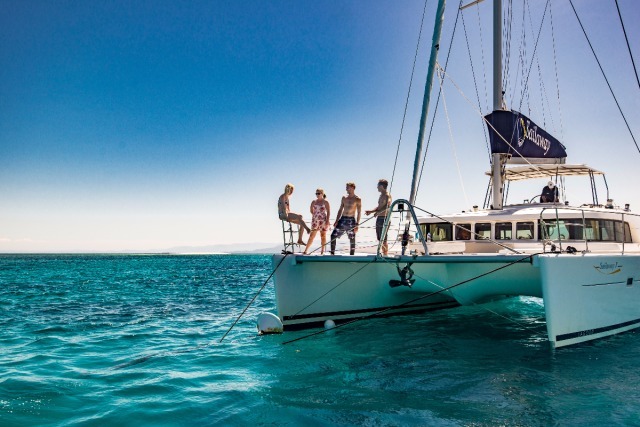 Luxury Catamaran Sailaway VII: This is the perfect sailing and snorkelling adventure for guests who can swim and have good mobility. Departing from Port Douglas daily. 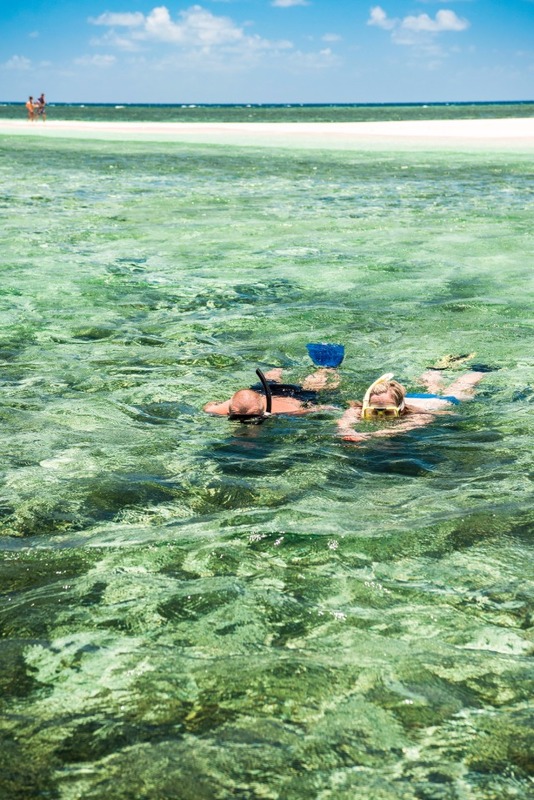 Nature activities include snorkelling over the pristine coral reef with a qualified marine biologist offering reef interpretation and a guided glass bottom boat tour. Premium reef sites showcase abundant marine life, including encounters with turtles and an amazing display of giant clam gardens. Exploring the white sands of the coral cays will relax the mind. Soak up the sun, peace and tranquility and swim in turquoise clear waters. The adventure begins with Heritage Rainforest joins the World Heritage Great Barrier Reef. 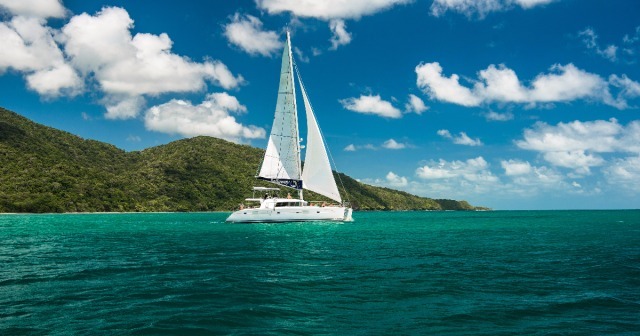 Guests can sit back and relax on the beautiful yacht and set sail to the Coral Cays of Mackay or Undine Reefs. They will enjoy an authentic sailing experience, just 10nm off the coast. 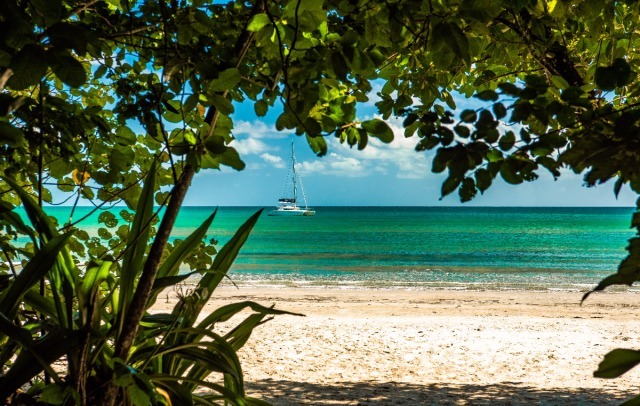 Nature activities will include snorkelling over the pristine coral reef with a qualified marine biologist offering reef interpretation and a guided glass bottom boat tour. Premium reef sites showcase abundant marine life, including encounters with turtles and an amazing display of giant clam gardens. Exploring the white sands of the coral cays will relax the mind. Soak up the sun, peace and tranquility and swim in turquoise clear waters. A tropical buffet lunch, morning and afternoon teas & coffees, supplied by local plantations, will complement a day of adventure and relaxation. Expert guiding and 1st class service are all included from helpful, friendly crew. 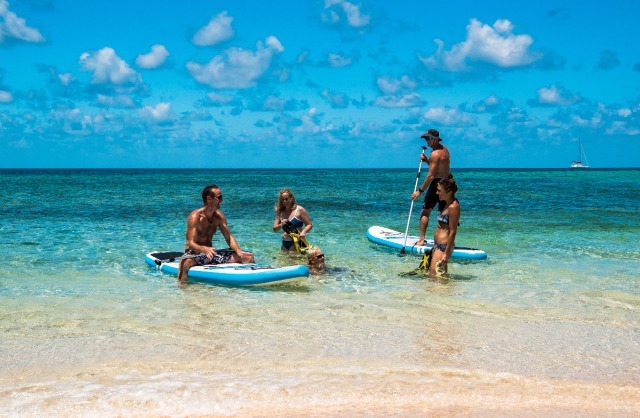 After a day on the outer reef enjoy taking in spectacular coastal mountain views, adding to the memorable experience. 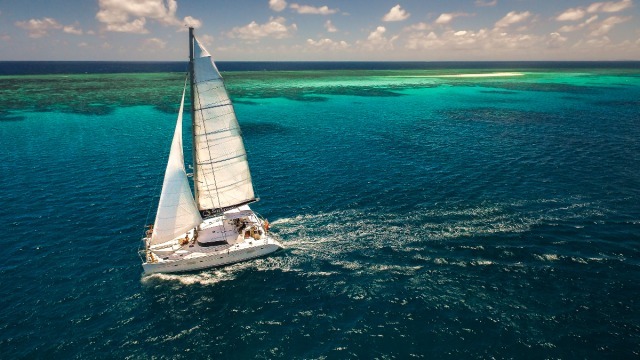 Immersed in the northern frontier of Great Barrier Reef, this is the perfect sailing and snorkelling adventure for a conservation minded visitor. 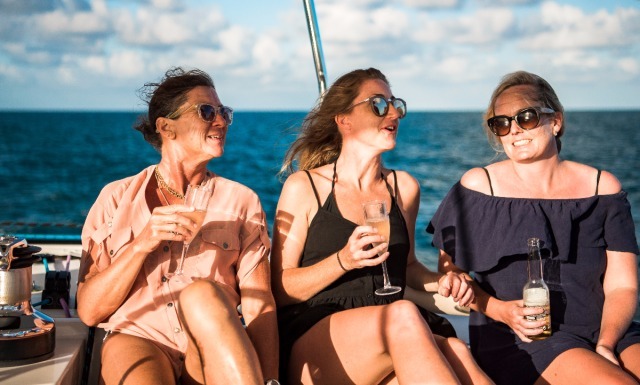 Discerning guests can fully enjoy an inspiring full day adventure using wind power to the absolutely stunning cays on the Great Barrier Reef in the most environmentally way! 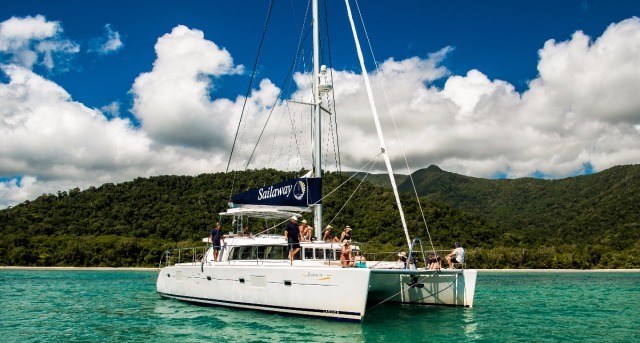 Sailaway has exclusive ownership of moorings at Mackay and Undine Cays on the Great Barrier Reef. Underwater Camera Hire – Take home fantastic memories of your Great Barrier Reef experience by hiring an Underwater Camera. We have LUMIX Underwater Camera’s available for hire, including an SD card which you take with you. Our experienced crew will show you how to use the camera and tips for taking excellent underwater images! Environment Management Charge of $6.50 per person, payable online at time of booking. The water is very clear at these locations and the coral is in very good health. The cays are surrounded by reef and are calm, even on windy days. If you have special dietary requirements please contact our office prior to booking. This is an adventure tour. Guests must be able to swim and have good mobility. 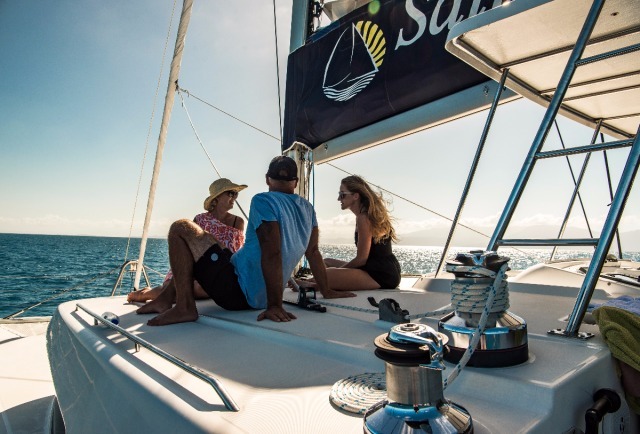 Port Douglas couple Steve and Katrina Edmondson are the passionate, hands-on owner/operators of Sailaway. They love the Great Barrier Reef and can't wait to share it wonder and beauty with guests from all over the world.